[B,A] = designVarSlopeFilter(slope,Fc) designs a lowpass filter with the specified slope and cutoff frequency. B and A are matrices of numerator and denominator coefficients, with columns corresponding to cascaded second-order sections (SOS). [B,A] = designVarSlopeFilter(slope,Fc,type) specifies the design type as a lowpass or highpass filter. Design two second-order section (SOS) lowpass IIR filters using designVarSlopeFilter. Specify the sampling frequency, slope, and normalized cutoff frequency for two lowpass IIR filters. The sampling frequency is in Hz. The slope is in dB/octave. Design a second-order section (SOS) lowpass IIR filter using designVarSlopeFilter. Use your lowpass filter to process an audio signal. 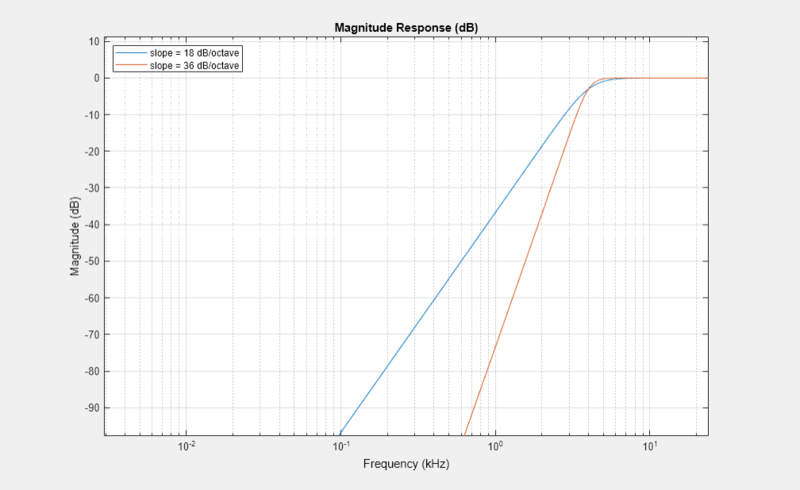 Design a lowpass filter with a 12 dB/octave slope and a 0.15 normalized frequency cutoff. Construct a spectrum analyzer System object to visualize the original audio signal and the audio signal passed through your lowpass filter. Design two second-order section (SOS) highpass IIR filters using designVarSlopeFilter. Specify the sampling frequency in Hz, the slope in dB/octave, and the normalized cutoff frequency. Filter slope in dB/octave, specified as a real scalar in the range [0:6:48]. Values that are not multiples of 6 are rounded. Numerator filter coefficients, returned as a 3-by-4 matrix. Each column of B corresponds to the numerator coefficients of a different second-order section of your cascaded IIR filter. Denominator filter coefficients, returned as a 2-by-4 matrix. Each column of A corresponds to the denominator coefficients of a different second-order section of your cascaded IIR filter.